Sometimes — even in this age of instantaneous communication — we are surprisingly insular. 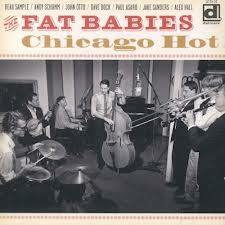 I had heard a good deal about this marvelous Chicago hot jazz band called, oddly, THE FAT BABIES. I knew they would be superb because of the musicians I knew: Andy Schumm, cornet and more; Paul Asaro, piano; Dave Bock, trombone and more; John Otto, clarinet and alto saxophone; and Jake Sanders, tenor banjo — all players I had heard in person and of course admired. Alex Hall, drums, and Beau Sample, string bass / leader, were names new to me, but I figured that musicians are known by the company they keep. At the 2012 Whitley Bay Classic Jazz Party I acquired a copy of their new Delmark CD, CHICAGO HOT, and before I had a chance to listen to it, I also became the happy owner of WHAT A HEAVENLY DREAM — a Fats Waller and his Rhythm project led by Paul Asaro, this on the Rivermont label. You can read my unashamedly ecstatic review of the Rivermont CD here. CHICAGO HOT is accurately titled. I was listening to it in the car today, and if you’d seen a very happy man at a stop light grinning like mad and clapping his hands and bobbing his head . . . three guesses as to that man’s identity. Before I begin to explain and rhapsodize — for I can do no less — if you visit the band’s website here, you can hear samples from the CD. The personnel is as mentioned above: Schumm, Bock, Otto, Asaro, Sanders, Sample, and Hall — with tuba legend Mike Waldbridge joining the band for the final track. The song titles will state where this band is at: SNAKE RAG / LONDON CAFE BLUES / SAN / ALEXANDER’S RAGTIME BAND / I SURRENDER, DEAR / DARDANELLA / BLACK SNAKE BLUES / HERE COMES THE HOT TAMALE MAN (with vocal interjections that I have taken as this post’s title) / FROGGIE MOORE / WILLOW TREE / WEARY BLUES / LIZA / PLEASE / SUSIE / TIGHT LIKE THIS / STOMP OFF, LET’S GO. So you’ll note the exalted Presences: Papa Joe, Jelly Roll, Louis, Fats, James P., Keppard, Doc Cooke, Bix, Miff, Bing, and their pals. No vocals or jiving around — no funny-hat stuff — just CHICAGO HOT. The Fat Babies have accomplished something brilliant on this disc and, I gather, continue to do so regularly in front of living audiences at Chicago venues and elsewhere. That is, they easily handle the question of “transcription,” “imitation,” “emulation,” “evocation,” and creative reinvention. What do all those words mean? 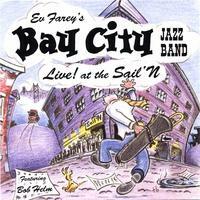 Put plainly, although many of the performances on this disc are based on hallowed recordings, I never got the sense that these living players were attempting to “play old records live.” Their success, for me, is in the way they imbue these monumental artifacts with their own personalities, playing within the style but feeling free to move around in it. Thus, for one example, Paul Asaro, when faced with a thirty-two bar solo on a song made immortal by Louis Armstrong in 1928, doesn’t place on himself the burden of “becoming” Earl Hines or “reproducing” Earl’s famous chorus. No — Paul Asaro plays Asaro in those thirty-two bars, drawing on a deep knowledge of Morton, Waller, and a thousand other sources. Dave Bock sounds like someone who’d be first call for a 1929 Henderson date; John Otto moves from Rod Cless to Darnell Howard. Andy Schumm, who has legions of starry-eyed admirers who want him to do nothing but become Bix before their eyes, evokes the tougher, more vibrato-laden work of Dominique and George Mitchell with a lovely mix of power and delicacy. And that rhythm section! I could listen to Asaro, Sanders (very wistful single-string solos and driving rhythm), Sample (somewhere Milton J. Hinton is grinning admiringly), Hall (who moves nimbly from the heavy brushwork Tommy Benford favors to evocations of Chauncey Morehouse, early Jo Jones — before Basie — George Stafford, Wettling, and other heroes) — swinging! That swing is worth noting in itself. Too many recordings / concerts devoted to some historically-accurate notion of what “early jazz” sounded like are at a distance from loose, happy swing. Now, I know that what constitutes “swing” and “swinging” changes from decade to decade and from individual subjective perception, but the Fat Babies don’t feel compelled to imitate the rhythmic conventions of a 1923 recording just because the Gennett disc captured a particular sound. But they don’t “update” in annoying ways: there are no quotes from ANTHROPOLOGY or BLUE SEVEN. I don’t write this about all that many discs, but CHICAGO HOT is a splendidly essential purchase if you feel as I do about hot music, exquisitely and expertly played. And a postscript. Liner notes are sometimes as energetically effusive — and just as accurate — as the blurbs on the back cover of a best-selling book. But Kim Cusack, reed wizard and singer, doesn’t do such things. He is outspoken and candid about the music he loves and the arts he practices — so notes by Kim are both a rare honor and testimony to his joyous endorsement of this band. And — as a bonus — I learned from those notes what the band’s (to me) odd name was. It comes from an expression young Beau Sample heard in his home state, Texas: “It’s hotter than a fat baby.” Now you know.